Let's admit it, at least for a year we are all done with these 3 things — green beer, shamrocks, and leprechauns. 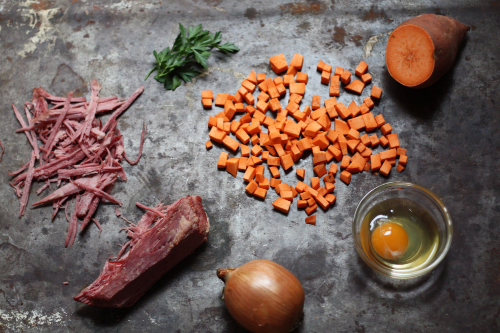 That being said, there is still one thing left that is haunting you from this weekend's past — the last bit of corned beef you make once a year in honor of St. Patrick's day. 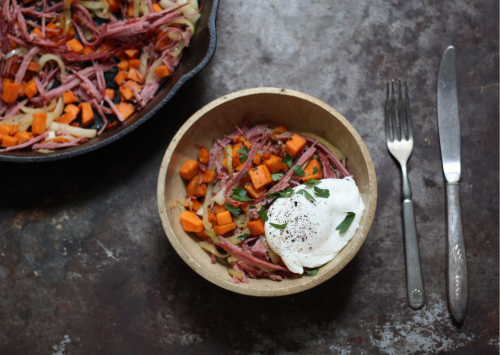 Instead of one more corned beef sandwich, let's turn that last hunk of meaty goodness into a sweet potato hash for a hearty brunch or dinner. 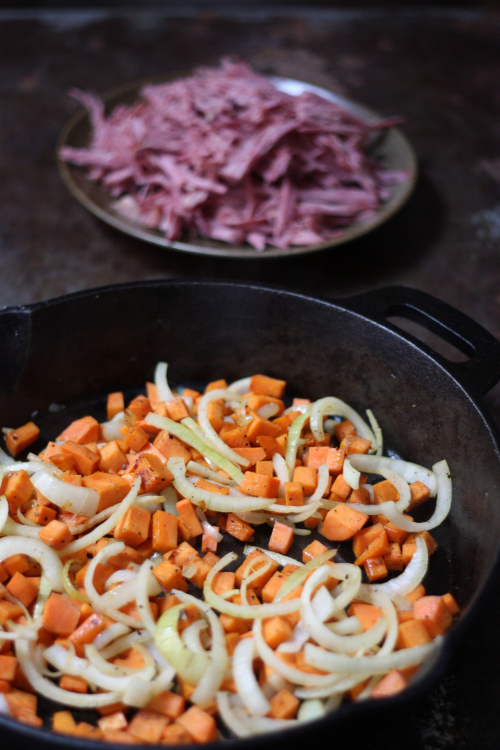 Simply heat oil in a medium sized pan adding the sweet potato and onion, stirring to coat with the oil. Let the vegetables cook over medium heat for about 20 minutes or until the potatoes are just beginning to soften. 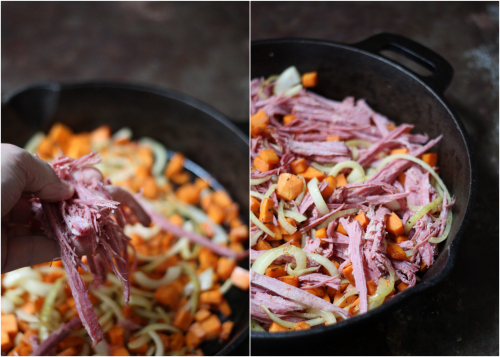 Add in your shredded corned beef and mix together well. While the corned beef is heating up. Bring a pot of water to a slight boil and poach eggs. 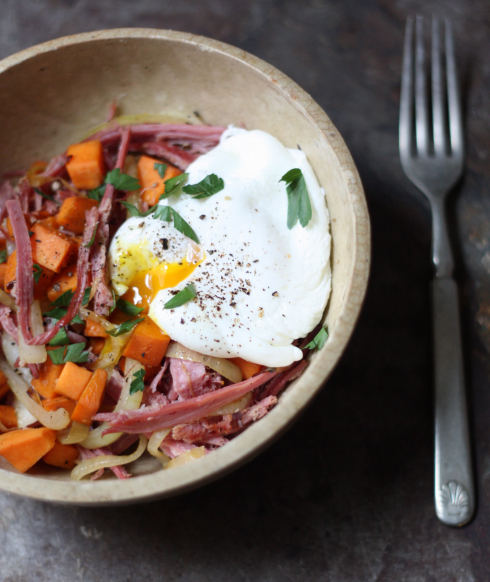 Break open the egg yolk and delight in this simple, flavorful and homemade meal. Now! You've taken care of the 4th thing you can put away for another year. See ya again next year, corned beef. 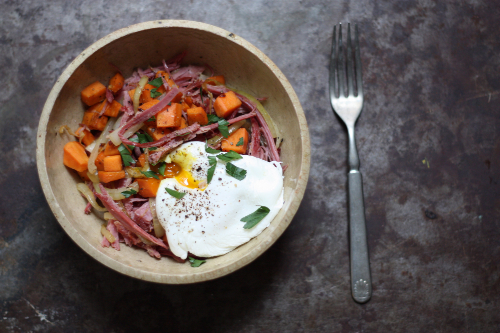 Excellent recipe, I've never used sweet potatoes in a hash, but it sounds like a good balance with the corned beef. Also, on an unrelated note, you should write more Kitchen Basics! Thank you and I do need to get back to Kitchen Basics! Thanks for the push.